capture attention, give enough content, and avoid having the employee put it down before they are finished reading it. See if this tip sheet for workplace wellness doesn't have that effect on you. Then download this reproducible, editable, and brand-able tool we produced just for you, the workforce management professional....EAP, HR, or Occupational Health and Wellness pro. mber of to-dos on your list could make your holidays merrier and brighter without the overwhelming anxiety and fear of not living up to everyone’s expectations. You can enjoy the holidays by eliminating the need to attend or organize just one event or by scaling down the amount of cooking or shopping that you normally do. Plan to delegate or take some shortcuts to give yourself some extra time to enjoy the season. Giving yourself “the gift of less” could be the best present you could receive this year. When you start to compile your holiday list, create two columns: “must have” and “nice to have.” Think about what is most important to you and your family and sort the list accordingly. Maybe this year you can skip the neighborhood progressive dinner or that dress-up New Year’s bash that you dread attending. Once you’ve created the categorized list, think about ways to simplify getting everything done. That may mean delegating, whether it’s to other family members or by hiring someone to help. Hate wrapping packages? Perhaps you can pay someone (young person or teen?) to do it for you. Take back that day usually spent in the kitchen baking by purchasing gourmet pies from the bakery this year. Ask your spouse or adult children to help with the shopping. Create a list, and then delegate in writing in order to reduce the numerous verbal instructions that can lead to conflict or forgetfulness. Don’t fall into the trap of perfectionism. Most people are satisfied with way less than whatyou think they want or need. Look at your list and choose one thing for your perfection goal. If decorating your home is what makes you happy, do that. If cooking a holiday meal is your thing, make that your perfection outlet. Become willing to scale back, delegate, and/or cut corners with everything else on your list. Another thing to consider as you mull over your list is what you’re willing to let go of. Hosting that big New Year’s party for 20 people as you’ve done in the past may not be realistic if you’ve downsized your home, recently had a baby, lost a job, or experienced some other stressor. Are you tired of being the person who is always in charge of the Christmas pageant at church every year? How can you let others take over this year? Hey! Perhaps everything doesn’t have to be done before Christmas Day after all! Send holiday cards out between Christmas and New Year’s Day. Don’t attempt to schedule events back to back. Instead, stagger visits over several days. There is no rule that you must celebrate with extended family only on December 25th, right? Lastly, look for shortcuts that will save time. Order gifts online for out-of-town family members and have these presents sent directly to their homes. You’ll save time wrapping presents and standing in line at the post office to mail boxes. Cut down your shopping time by giving some people on your list gift cards. Many teenagers (especially) and extended family members will be happy to choose their own presents. 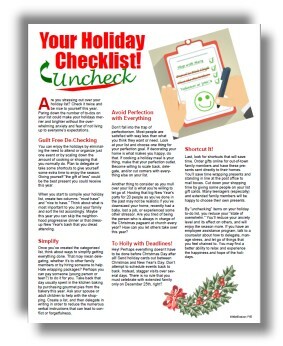 By “unchecking” items on your holiday to-do list, you reduce your “state of overwhelm.” You’ll reduce your anxiety level and its effect on others, and will enjoy the season more. If you have an employee assistance program, talk to a counselor about how to delegate, manage stress, and let go of things that you feel chained to. You may find a better ability to relax and experience the happiness and hope of the holidays.